With problem statement in hand, we set off to familiarize ourselves with this growing audience. We primarily (almost exclusively) listened, using the opportunity to hear and understand how NPR News fit into the daily life of our users. Along the way, we identified and investigated the app’s current shortcomings, as well as how it might better serve both the current and future audience. We then followed up these user interviews with a deep dive into the existing analytics, to help paint a holistic view of our users. From this work, four user personas clearly emerged: Rita the Reader, Steven the Station Stream, Patty the Program Listener, and Chris the Playlist Maker. Using these personas, we crafted a focused and unique positioning statement for the News app, including how it fit within the digital portfolio of NPR products — NPR One and NPR.org. With an informed and inspired understanding of our users in place, we convened a Station Advisory Group to help assess the importance of the NPR News app to member stations. Station leaders from KUOW, WCPN, WGBH, WPR, WIUM and WUWM joined us for that discussion, and helped us explore where the News app fit into their digital strategies today, and how it might better align to their goals in the future. As the user interviews and Station Advisory Group concluded, a clear and actionable roadmap began to take shape. From our user research, we learned that the primary use of the app was for reading and station streaming. 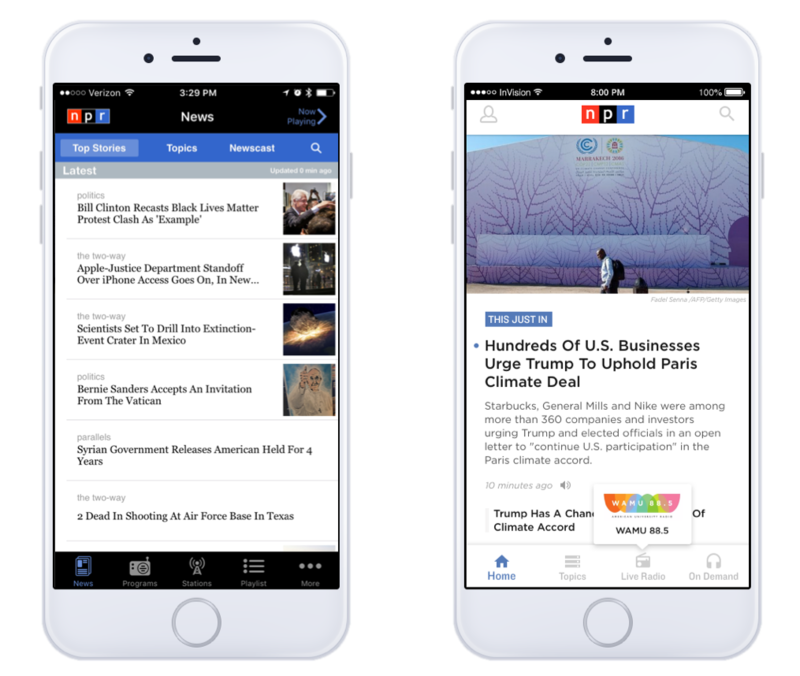 From a station perspective, we learned that the News app presented a renewed opportunity to encourage and facilitate collaboration across the digital network, particularly in the breaking news space. As we crafted this roadmap, one major technical need became apparent almost immediately: to accomplish all of these priorities, we would need to rewrite the app from the ground up. A bit of historical context is important here: the current News app was built in 2009, and much of the code it was written in remains unchanged. Building on top of that old code would make accomplishing our goals nearly impossible, as we would struggle to deliver the reliability and performance that users expect from an app in today’s landscape. So, the decision was made to start the project on a brand new codebase. With that decision in place, the necessary team was assembled in the latter part of 2016, and we began active development on a new app in late Fall. Since then, we’ve made great strides on both the technical and design side. The design effort, being led by two extraordinarily talented and highly respected design and user experience experts, seeks to blend the best parts of the current app, while bringing significant improvements in functionality and ease of use. On the development side, the app itself is being architected and built by the same team who built NPR One. This is a huge win for this project and NPR, as it ensures not just a strong and reliable application, but one whose core is designed to be integrated seamlessly with our other product lines. We still have quite a bit of work ahead of us, but we’re currently working towards (and on track for) a release in early Fall 2017. Shortly before that launch, we’ll be opening the app up for both an internal and public beta, so be on the lookout for more information and invites to that process. Until then, we’ll be focused on making the new app as loved as the current one.